Vacation rental house. Sleeps 2, 1 bedroom, 1.5 bathrooms. Dogs allowed. Unit 7 Block 1 Lot 5 ... A wide open blue ocean view with total privacy, no abutting houses, just surrounded by a peaceful meadows. 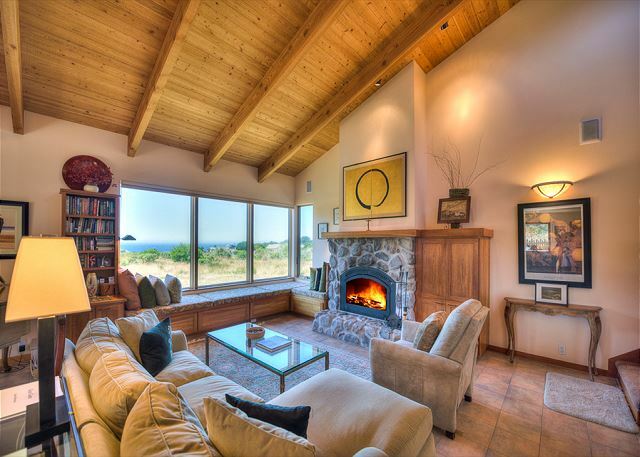 A warm cozy home designed by Architect Steve Brodie, with window seats and a stone fireplace. Located within easy walking distance to the bluffs and Pebble Beach, Black Point Beach and the Moonraker pool and tennis court. A mile to the Lodge and Post Office and a five minute drive to the popular Two Fish Bakery. Amenities include Wi-Fi communications, a baby grand piano, a telescope, stereo, DVD & VHS, and a bedside Bose radio with a CD player. Dogs welcome. Due to safety issues, homeowner suggests guests age 18 and older occupy this home rental. Bed linens and towels are not included with this rental. GREAT House, But The Cupboard Was Bare! A beautiful house & location......but, WOW.....for those who love to cook, salt wasn't even present in the pantry. Usually every Sea Ranch house we've stayed at has basic supplies such as spices; oil; vinegar, flour; sugar + laundry soap, but zippo here. The houses that offer supplies to us is where we leave ours behind! Overall the vacation rental was great. Comfortable house with nice amenities and view ( although it was smoky during our stay). Dog friendly with a small courtyard big enough for him to go out when we weren't taking our long hikes. It was outstanding, from beginning to end. Beach Rentals is the only way to go! Love this pet friendly little home. The location is fantastic and the views of the sunsets glorious. Thank you. Wonderful home just right for the two of us and our dog. Very private and quiet with nice views. Beautiful home, good location a moderately easy walk to the Lodge, brought our lab, and had a great stay. Perfect home for a couple. Nice and private. Great radiant heated floors. Spent a week here and didn't want to leave! Dogs loved it, too. lovely, dog friendly home with view of ocean. home is beautifully decorated, kitchen stocked with all we needed to cook, great, quiet location, and dog friendly. only wish the bed was a king instead of a queen. Lovely home with great view of the ocean and sunset! Wonderful window seats to relax in and read while still having the ocean view. Very functional kitchen (although the stove timer, which we never used, went off in the middle of the night twice....).. The closest beach, Pevble, was lovely and devoid of all people! 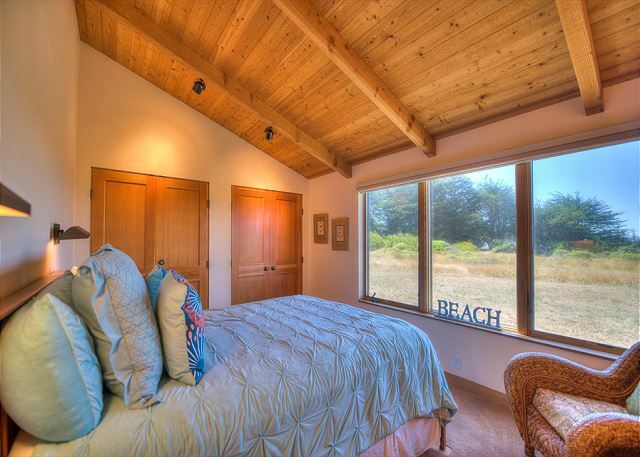 Overall, the BEST home we have stayed in, and we have been coming to Sea Ranch annually for years! We had a lovely time at Sea Gate, we really appreciated being able to bring our older senior dog with us! The house is beautiful, and we were very content spending our days in the window seat watching the day pass by. Can't wait to return. Thank you! This was exactly what we needed. To get away from everything, unplug and recharge. This was perfect. Sea Gate enhanced our month long north coast experience. We started the day with breakfast in the sheltered side patio on sunny mornings before the day's adventures on the trails and beaches. The window seat called to us late in the afternoon to relax while savoring the meadow view and dinner was a time to cook slow food while listening to David's piano recital. The house was furnished in casual inviting harmony and our Siberian husky Gem loved the fenced yard to lounge and watch the natural world around her after her day on the trail. Sea Gate had the cozy clean functional comforts with an airy feel and just enough glass for light and fresh breezes that made it feel like our home away from home. The covered entry was a convenient portal to leave shoes and clean dog paws and the and central vacuum made it easy to clean and were only a few things that could be improved to make it the perfect vacation rental. What a wonderful place! We didn't want to leave. Loved everything about the house, location perfect for walking out the door to the miles of trails, great to have a little fenced-in yard for the dog. Very comfortable, spacious house, beautifully furnished, well-equipped. We left a note with our pouch you gave us. All concerns were listed there. It was a stormy December weekend, and this was the house to be in. Great fireplace, kitchen & lots of comfy spots to hang out and watch the rain. Beautiful, private and perfect place to "let is all go"!! This is a beautiful home. Walls filled with very interesting paintings. Large windows with seating to relax and enjoy the view of the blue water ocean (sometimes white water if windy enough). Our little Pom/Poodle loved the fenced in yard. We cracked the door and he could come and go as he pleased. The home was very clean and had almost anything in the kitchen you need for you to prepare meals. I look forward to returning!! We had a very good time. The unit is well laid out, it was clean and well maintained and we had a nice view of the ocean. We definitely would return to it. The only negative comment that we have is 1) there is only one chair in the living room area (the rest are couches) and 2) the lighting in the living room area is not conducive to reading (although reading can be done). Lovely home, very private and quiet. We come up to Sea Ranch every year to escape fireworks in our community, and were grateful for the peacefulness. The home is lovely, only request would be for a gas grill and some additional cooking utensils (i.e. spatulas, serving spoons) but otherwise we enjoyed our visit very much. A perfect stay in a lovely home. Gorgeous view down the meadow to the ocean. Other houses only barely in sight. Lucky to be there when wild irises and california poppies are filling the meadows. The only thing I could ask for would be shorter kitchen counters! ( - : (The owners are obviously tall people!) And thank heavens the tv is upstairs in the loft out of sight - please don't move it downstairs! Will be back this fall - have found my Sea Ranch home away from home. 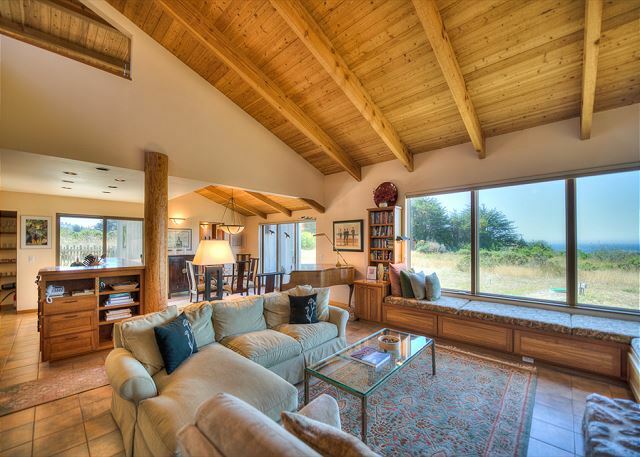 Sea Gate is a wonderful property and well-located within Sea Ranch. Trails along the bluffs are a short walk as is beach access. The views are stunning and it is a wonderful place to unplug and enjoy the beauty of nature. Sea Gate is a lovely home with all the amenities you could hope for. From making the reservation to checking in then out, Beach Rentals helped make this vacation a most enjoyable one. It is hard to find pet friendly homes to stay in. Sea Gate met our 7 year old lab's needs ( and ours) perfectly. From the enclosed area for her safety and dog friendly interior not to mention easy access to miles of walking trails, Sea Gate felt like home away from home ( without the stresses of our daily lives). Sea Gate served as our second home while we were moving out of our Sea Ranch home. It is quiet and convenient. The doggies wanted to stay. Although we stayed only three nights it felt like a week long getaway. Sea gate is a quiet relaxing space close to the spectacular coast and the sounds of waves crashing on the shore. Such a beautiful home, we had a fabulous time! My only feedback would be to state in the home description that the telescope is decorative only, then we would have brought our own so that we could enjoy the beautiful night sky. Fantastic time. Loved the window seats. Also loved that the TV was upstairs so not a temptation to watch. Walking through to living room a little cramped: telescope and piano took up a lot of space. But piano was wonderful to have. We enjoyed Sea Gate cottage very much. It was definitely the nicest "dog-friendly" place we've rented in the Sea Ranch. We had a delightfully restful time in an extraordinary setting. The house includes a small grand piano and a bench full of music. What fun! (but the piano could stand a visit from a tuner). All in all a wonderful five days. We have been renting from Beach Rentals for over 20 years and we have never gone wrong, great houses and great service. We rented Sea Gate from their recommendation and we really enjoyed the house, great view, clean and cozy. Our dog enjoyed the window seats for viewing the local deer, really nice vacation. A beautiful well equiped well located home. We loved our stay. It is a bit expensive but well worth the price. great stay with little fog - in July! music and a lively fire - something we rarely do at home. Sea Gate was perfectly located. About a five minute walk to the bluff trails and about a five minute drive to Two Fish Bakery. We felt very welcomed and loved the Welcome Package and basket full of toys available for our dog. We would love to return for a week next time - our three days were wonderful, and we could have stayed longer. Very nice home with comfortable decor and wonderful fireplace. Great separation from other homes. Loved our entire time in this nice rental! Sea Gate is a sweet home with a generous blue water view across common meadow. It is a wonderfully cozy cottage to curl up with your dog and your favorite book and watch the deer graze just outside the windows. The only negative is the lack of a direct path to the ocean from the back yard due to wet terrain and the owner does not allow use of the garage. Great rental for a couple (with a dog). Would suggest they consider putting TV downstairs; fairly inconvenient with it upstairs. Thx. Sea Gate is very compact, but also cozy and neat and easy to settle into. Furnishings are lovely and there's a nice little patio area with attractive landscaping where it's fun to sit and watch the hummingbirds. Good for pets, too. A very nice house: great location with lots of privacy and close proximity to several beaches, very well maintained, dog and music friendly, and it has a grand piano! We had a very relaxing time and saw several beautiful sunsets right from the house. Our dog loved the fenced yard. We hope to stay at the house again when we go to Sea Ranch next time.